Laughter may actually be the best medicine! People define happiness in many different ways, but at its core, leading researchers have proven that happiness involves feeling positive emotions, expressing that life is good and meaningful. Understanding, accepting and living this idea of happiness reduces your risk of heart disease, strengthens your immune system, and might ultimately add years to your life. 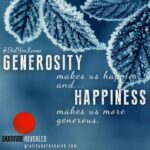 Happiness is also deeply intertwined into the idea of “Pay-It-Forward” and when you are happy, you tend to prioritize positivity in your day-to-day activity. When you laugh or smile or even think a good thought, your body responds to that just as much as your mind does. It doesn’t take much to realize how beautiful the world around you really is. Have you noticed differences in your health when you smile more? The more beauty you see, the more you smile—and the healthier you feel. Select a graphic you love below and share Gratitude Revealed with your friends and family. Help gratitude go global!